The Gro company is a brand that as a family we have grown to love! They would definitely feature on my must buy for new baby feature right now if I were to post one. Now we have several products created by them and one of our favourites is definitely the Travel Gro bag which makes life so much easier when travelling with a baby/toddler. 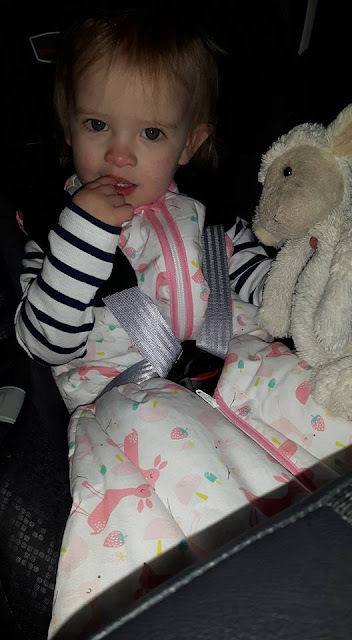 The Travel Gro has holes so that a five-point car seat harness (and pushchair straps) can fit through meaning that you can use this in the car or pushchair instead of blankets which would most probably fall off. This product is so ideal if you're off on a long journey and want to have your baby ready to pop straight into bed once you get home! Or if you've got an early start you could quickly change their nappy and pop them in the car to (hopefully) continue their sleep. Isabelle loves to just snuggle up in hers - it's so warm and cosy that's probably why. OR if you're one of the parents that finds themselves driving around to get baby to sleep - this product is made for you! 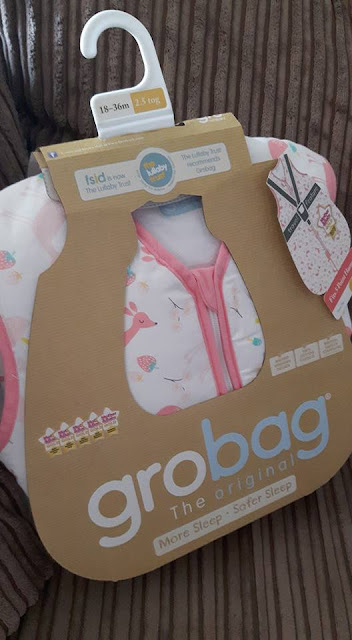 The bag comes in a lovely selection of bright colourful designs like all of the products by The Gro Company the material is good quality and made to last. It's super soft and washes lovely. 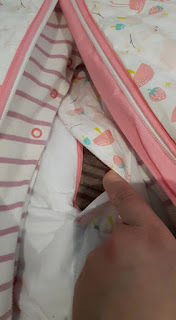 I have been using this bag for just under 8 weeks now and it is still looking like new which is a massive thumbs up from us! We love products that are made to last and actually I have some of Oliver's gro bags from when he was a baby and although they may be blue - they are perfect still. I think they're all unisex really - what does it matter if a girl uses a boys gro bag and a boy uses a girls gro bag? At the end of the day - they're in bed.. asleep! As long as they're cosy and warm. I know not all babies/toddlers like to sleep with a grobag on but Isabelle sleeps so much better with one, so if you're considering one because your child keeps kicking off their covers and getting cold therefore waking up and waking you up from that amazing sleep then I'd definitely suggest giving one a try. We haven't come across any problems so far or anything that I would change about this gro bag to be honest with you. It's now the perfect part to our bedtime routine. This one retails for - £26.99 which I wouldn't want to buy loads of but the brilliant thing is that you don't have to, this one seems to be lasting really well! Having 2 grobags means that one can be in the wash and one can be used. You can get cheaper versions but they just aren't as good. We have had several and they don't wash as well as the gro company's ones, they are not made as well and their sizes are not as generous. I know my 2 year old would move her head if a blanket went over it now but I guess I'm in that habit where basically I don't want to take the risk. She doesn't yet have a pillow - I haven't been that brave yet. 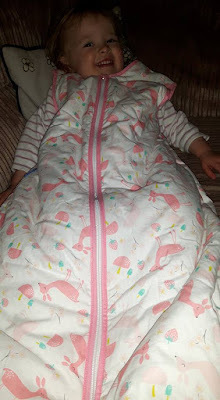 Being an anxious mum, I just love how safe this product is, it makes me feel reassured that I don't need to worry about Isabelle wearing it all night long and I used them when she was younger too - as soon as she weighed enough she moved from her swaddles to a grobag. 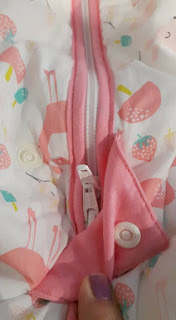 Now she's at a cheeky age, I'm noticing little things such as the zip being hidden behind popper fastenings to prevent her from getting out of it before I want her to! There's plenty of room within this gro bag so she can kick her legs around and move around easily when she's fast asleep without feeling constricted whilst not being able to kick it off completely being left cold for the night = waking up. I still don't understand why everyone isn't using gro-bags it makes perfect sense to us as the child is so safe inside. 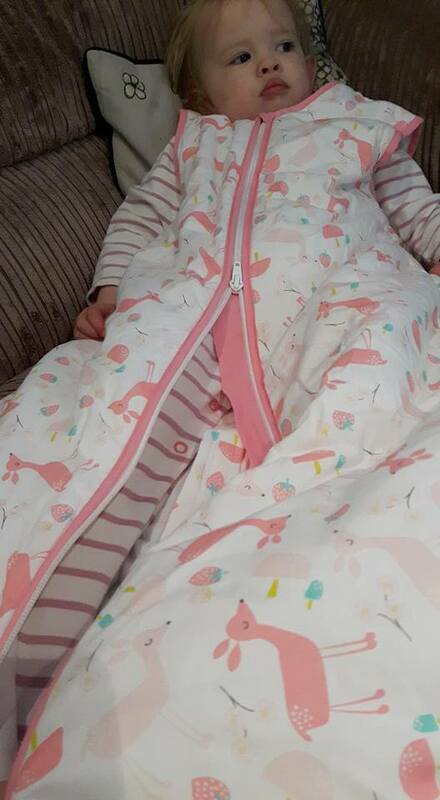 We were sent 2.5tog which is keeping her nice and warm, it's age 18-36 months so she'll be wearing it for some time yet as she's fairly small for her age. I wouldn't hesitate in recommending this product to a friend, it's an investment for peace of mind at bedtime that also doubles up as something you can use on the go. If you go on holiday this is ideal too! *Michael, I'd love to go on holiday by the way...* Got to get the hints in somewhere huh? I've washed this a lot of times as I said and popped it into the tumble dryer and it's been fine!